Buying a bespoke suit is an investment, and as with any investment, your suits should be well cared for. This is important in order to preserve their appearance and maximise their life span. The first thing to understand is that when you first start to wear a new bespoke suit it will begin to settle in and you’ll get a much better feel for the fit. It’s worth remembering that bespoke clothing differs from ready to wear, in as much as the garment shape will develop as it’s broken in. Our advice is to dry clean your suits as rarely as possible as the chemicals used during the dry cleaning process strip out the natural oils found in the wool. This damages the cloth and in turn shortens the life of the suit. Ideally, a suit should be dry cleaned no more than twice a year but if more cleaning is required then remember a good dry cleaner will also be able to ‘spot clean’ any dirty areas. Regular pressing of your suit is fine, helping to remove creases and bring shape back into the garment. When selecting a dry cleaner it is worth spending a little more and going to one accustomed to dealing with bespoke suits. 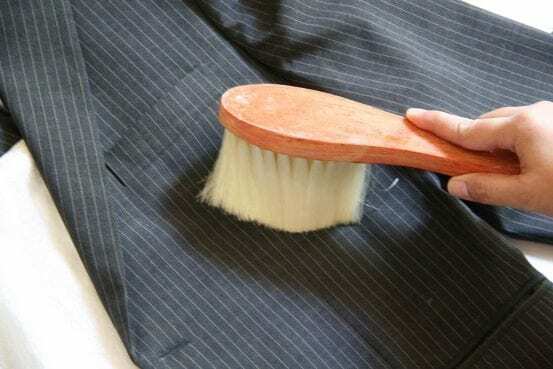 A suit needs to be regularly brushed, much like human hair, to ensure it looks its best. As well as removing dust, dirt and food particles, brushing helps to redistribute the natural oils in the cloth fibres which will prolong the life of your suit. We recommend you brush your suit after every wear and use a high quality, pure bristle brush. Don’t wear the same suit everyday! Over use is a sure fire way to shorten the life of your suit, wearing it out too quickly. Give your suit a chance to rest and breath in-between wear, alternating it with other clothing will help to increase its life span. If you want to own a handmade suit, then a custom tailor must be your top priority. Custom clothing options are becoming a trend because mass-producers of apparel only supply generic sizing with their products. Most people are far from average. That is why a tailor-made, bespoke suit is a top priority for today’s professionals.